So Rafa won both tournaments on the men's side, upping his grand slam count to 8 and putting him safely on top of the rankings. Roger, on the other hand, lost in the quarterfinals of both tournaments, sending his ranking spiraling down to a tragic #3 (tragic for Roger's standards, anyway.) While I don't think this is the end of Roger winning grand slam tournaments, I do think that he'll have a very hard time getting the #1 ranking back, given that he's turning 29 next month (that's old in tennis years), and the rest of the top 5 are all 25 years old and younger. Good thing Roger's already won the French Open as well 15 other grand slam titles before, so this doesn't feel like we're watching the decline of a career of a should've, would've, could've been has-been. It's like a glory lap for the all-time champ. Although Roger probably has more plans than turning the next few years into a glory lap, seeing that he's hired Paul Annacone, as his new part-time coach. Annacone coached Pete Sampras from 1995 to 2001, during which Pete won 8 grand slam titles. He also worked with Tim Henman, another serve and volleyer, after coaching Pete. So it looks like Roger is looking to beef up his serve and volley game by hiring Annacone the same way that he was looking to beef up his clay-court game by hiring Jose Higueras a couple of years ago. Anyway, we had a first-time grand slam champion in last year's US Open, so if Roger and Rafa can't sort their stuff out by August, we might get another one this year. On the women's side, Serena won her 4th Wimbledon title, and her 13th grand slam title overall, over surprise finalist Vera Zvonareva. Actually, the semifinal line-up on the women's side was filled with surprises, after Bulgarian Tsvetana Pironkova upset Venus in the quarterfinals and up-and-coming Czech Petra Kvitova beat the just-as-young but higher-ranked Caroline Wozniacki and Victoria Azarenka. 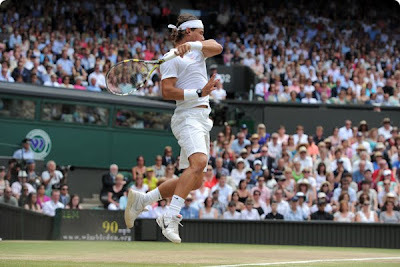 The best moments of Wimbledon for me though would have to be 1) Federer's 1st round match against Colombian Alejandro Falla, where Roger had to claw his way back after losing the first two sets and then going down a break in the 3rd set to win in 5 sets (6-0 in the fifth) to avoid the biggest upset in Wimbledon history, and 2) the epic, historic, record-breaking 11-hour first round match between American John Isner and Frenchman Nicolas Mahut. The quality of play really wasn't as high as any of the matches in the later stages of the tournament, they were basically just trading aces and service winners... But they were doing it for 11 HOURS! That's a 6–4, 3–6, 6–7(9–7), 7–6(7–3), 70–68 scoreline! That's like 3 marathons! 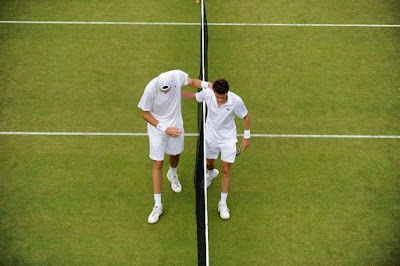 The sheer determination and will to win (not to mention the stamina and athleticism) displayed by both players just to survive the 11 hour match was just amazing to watch. On to the US Open!